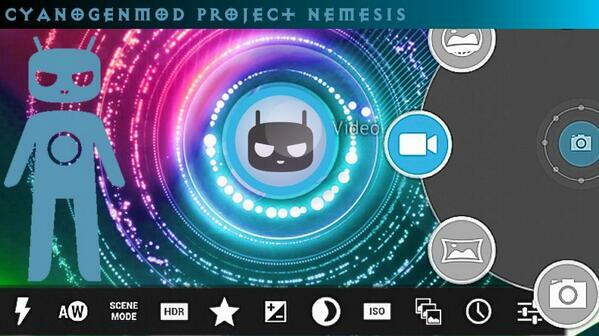 Nothing much is known about the new project from Team CyanogenMOD except for the fact that it is known as Nemesis. The CyanogenMOD Nemesis has leaked just one information about the new ROM and it is about the new camera App called 'Focal'. The Focal takes forward the Google's stock camera App released recently about which you can read here. The Focal will be installed automatically once you install the CyanogenMOD Nemesis ROM on your phone. The App has a Google Now like radial menu with 5 options, viz. Photo, Panorama, Video, PicSphere and Switch Camera out of which the PicSphere looks like new feature. And here to you don't have look far for inspiration behind the PicSphere. Taking a leaf out of Google's Photosphere, CyanogenMod Team has build this open source feature and it seems very nice at first glance. However as this post is not about 'Focal', and if you want you can read about the 'Focal' and all its relevant information from AndroidHeadlines website here. "My goal for CM has always been to break open these mostly proprietary mobile devices so we can turn them into the product we really want. I think over the last few years, we have largely accomplished this goal- CM is available in some for almost every device imaginable. What's most important to me is that anyone can get the code, hack on it and change whatever you want, build it, and flash it to your device. It's a huge amount of work, and has left us little time to work on other things. This is good and bad though. Just as Google made it easy for so many people to get into mobile with Android, we've made it easy for anyone to get into making their own aftermarket ROMs. It's awesome. There's so much crazy stuff that people are building that nobody has thought of before. Nemesis is our plan to improve the user experience in the right places. The new camera app, Focal, is just the start. Without giving too much away, invoking teaser videos, or giving ETAs, I can confidently say that awesome things are going to keep coming. Watch out :)"
As you can see, the CyanogenMod's work theory involves around a simple logic, breaking open the proprietory systems around the world so that you, users can have and extract the best possible experience from your devices.